When you reflect on your life, past and present, is it a new season for you? Do you find another season has come and gone? It is no secret that millions of people around the world are impacted by mental illness. In America alone, one in four adults experiences mental illness in a given year (National Alliance on Mental Illness [NAMI], n.d.). That is over 60 million Americans my friend. I know. I am one of the millions. I have a loved one who lives with bipolar disorder. Concerning the one in four adults who go on to experience mental illness, they have loved ones who are impacted as well. Can you imagine what the numbers would look like if we tried to calculate the sheer number of people impacted by the mental illness of a loved one and/or a friend? We may not have an exact count on how many of us are impacted by the mental illness of a loved one, but we do know that on a daily basis someone, somewhere has a loved one who has either just been diagnosed with a mental illness or who is being affected by mental illness. This too I know. It was about three years ago that I was one of those that would learn that my loved one lives with bipolar disorder. Additionally, I would learn that I would become intimately connected with the world of suicide, in particular, I would learn more than I ever wanted to about suicide attempts. In regard to when mental illness entered my life, and based on my experience, I felt that little existed to help me cope with my loved one’s illness. I felt alone. I felt a sadness so deep that I cannot describe it in words. Slowly, as I walked the path with my loved one, I discovered that I am not alone! There are people and organizations just waiting to help. And that is how “Stacy’s Flutterings” blog came about. I don’t want anyone to ever feel as alone as I did as I learned how to help my loved one. Also, the resources that I have discovered are just too vital to keep to myself. I had to share. And so share I did, and I keep sharing as I go. Of course, I will never know if this tiny space on the world wide web has truly helped anyone. I will never know if this one mom among millions has had any impact. My voice feels very small in this infinitely large world and yet I still sing the words of hope. In an effort to continue to spread the news that there is hope I have created what I call “Stacy’s Lantern of Hope.” If you have found yourself here, please join me by sharing my lantern of hope in an effort to let those know, who are either just learning of their loved ones mental illness or who are in the depths of the illness with their loved one, that they are not alone and that there are credible resources available. 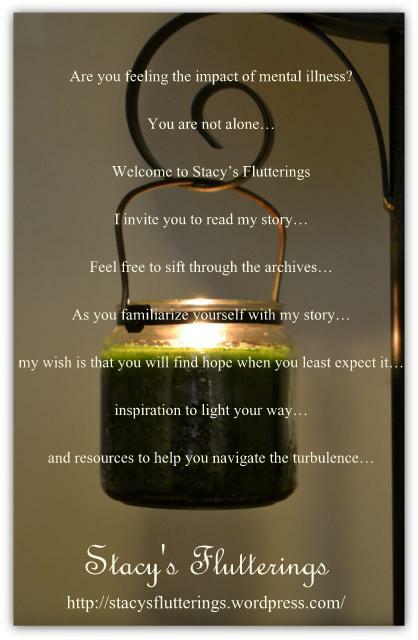 Just like the words on the lantern say, my wish is that you will find hope when you least expect it here on Stacy’s Flutterings, inspiration to light your way and resources to help you navigate the turbulence. If this is the beginning of a new season and the end to another just know that you are not alone. Edible Cookie Dough? Now We’re Talking!